This is a version of an article I wrote for the superb Mondial magazine, produced by Rapha. When Émile Zola lived in London between July 1898 and June 1899, he spent a lot of time on his bike photographing women on their bikes. The French author was in Norwood, a town dominated by the vast glass Crystal Palace exhibition hall, and most days he cycled around his unfamiliar environment. Zola attached a camera to his handlebars so he could take “photos that were marvellously sharp and clear”. He intended to “make an album of exile”, a record of his strange secluded months in south London. This was eventually published in 1997 by The Norwood Society as Emile Zola: photographer in Norwood, South London 1898-1899. Zola arrived in London on July 19 1898, carrying a nightshirt folded inside a newspaper and a piece of bread. He had left Paris in haste following his role in one of the great scandals of French politics. Alfred Dreyfus, a French soldier, had been accused of passing secrets to the Germans; Zola believed Dreyfus was convicted only because he was Jewish. He defended Dreyfus in a newspaper editorial – J’Accuse – and was charged with libel. Rather than spend a year in jail, he fled to London. The bicycle was part of this modernity, providing users with freedom and ease of use. Bikes crop up repeatedly in Zola’s photographs – on dusty roads, busy high streets, outside the Crystal Palace and in surrounding country lanes. He was particularly interested in one type of cyclist: women. Of the 100 plus images compiled by the Norwood Society, 15 feature women cyclists. They wear long skirts and hats, some wheel their bikes uphill or swarm past the camera in groups. The only two male cyclists Zola photographs have female companions. “I meet women who cycle in all weathers in order to go shopping,” Zola marvelled. His photographs prove these words to be true. Zola returned to Paris in 1899 after Dreyfus was pardoned by a new French government but this was not the only time the Dreyfus Affair touched upon cycling. Another Dreyfus supporter was Pierre Giffard, the editor of France’s leading sports paper, Le Vélo. His pro-Dreyfus stance led to arguments with advertisers, who withdrew support and formed their own newspaper, L’Auto. In 1903, with circulation low, L’Auto writer Géo Lefèvre suggested the magazine should invent a profile-rising six-day cycling race around France. Henri Desgrange, the editor, was intrigued. “As I understand it, petit Géo, you are suggesting a Tour de France.” And so it came to pass. I wrote about Suede for the current issue of Uncut. This was something of a revelation for me, as I was able to remind myself how excited I was when I first heard Suede – I remember playing “Animal Nitrate” over and over again in my bedroom, thinking that I’d finally discovered a band I loved as much as The Smiths. Before interviewing the band, I went to see them play at the Roundhouse and all of that old energy was still there, and I was just as thrilled as I had been at 16. One angle covered in wide-ranging interviews with Brett Anderson, Mat Osman and Neil Codling was the importance of London to the Suede aesthetic – this was a band that even renamed themselves The London Suede, albeit under duress, for their American releases. When the band were formed, Osman and Anderson shared a flat on Hilever Road in White City “on the border with Notting Hill – bohemia one way, estates the other,” Osman said, and Suede’s music came to occupy this very same sort of space, the sort of London written about by Patrick Hamilton, Dylan Thomas, Gerald Kersh and Roger Westerby in those novels about outsiders arriving in London and being instantly swallowed by vice and excitement. Doing something similar around this time was the TV version of Hanif Kureishi’s Buddha Of Suburbia, with a soundtrack by David Bowie – the combination of Suede and Kureishi is what led me to Bowie. Anderson told me he’s still inspired by London, often cycling the towpath from his home to West London to Camden, even if it doesn’t directly appear on the band’s new album. The excellent Night Thoughts is instead preoccupied by those unnerving concerns about children and fatherhood that keep Anderson – and myself – awake at night. I’ve spent the past week immersed in Played In London, a book that is about as ambitious as any you are likely to see published about London this year. Written by Simon Inglis (author of the seminal book on British football grounds) for English Heritage, it attempts to tell the story of every sport that has ever been played in any venue in the capital – that’s everything from lost Tudor skittle alleys to skateboard parks, including all the major football and cricket grounds as well as lost lidos and billiards halls, archery grounds and greyhound tracks, relocated diving boards and blue plaques. There’s even space to mention rugby netball, a sport created in 1907 by soldiers on Clapham Common and which is still played there every Tuesday and nowhere else. It’s a breathtaking accomplishment, full of terrific nuggets of information – did you know there were Eton Fives courts under the Westway, or that the BBC’s Maida Vale studio was built in an old rollerskating rink? – but also attempting to tell the story of how a city and its people indulge in play, how that play is shaped by the culture and topography of the city, and how it develops over time, often wittingly reinventing itself as a ‘heritage’ sport rather than die out. This is social history as much as anything, but goes much deeper than any other book I’ve seen on the subject, like the marvellous Pleasures Of London. 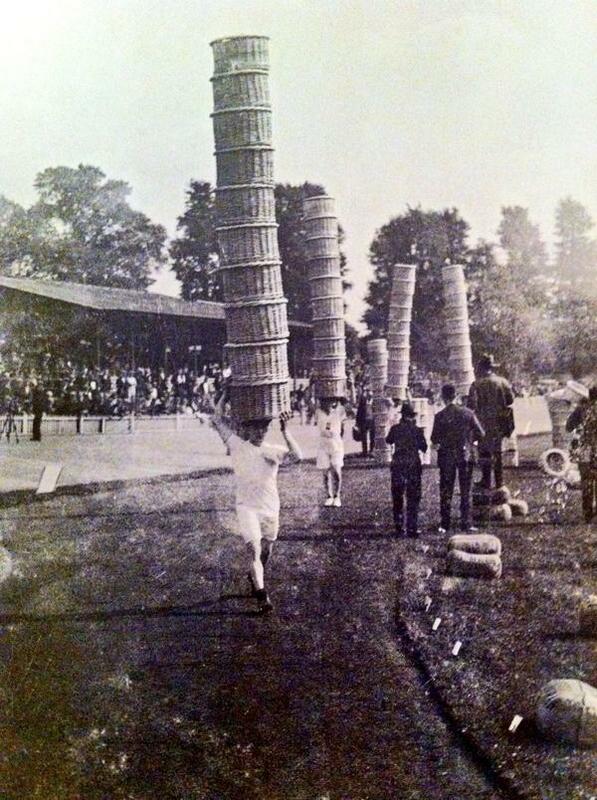 One fascinating section looks at the history of company sports grounds. There were once dozens of these in south-east and south-west London – Catford had several – where civil servants or bankers could take part in regular games of rugby or football, or enjoy the annual sports day. Knowing more about these events, Inglis says, would let us learn so much about the culture of work, belonging and inter-office bonding in 19th and 20th century London. Given the scale of the project, the navigation of the book can be a little complex, but the layout makes sense over time. Inglis begins with an overview of the history of sport in London and of London parks and open spaces, before examining several areas in greater detail to see what they tell us about sport and London, and how certain spaces have been used repeatedly over time. He uses the phrase sportscapes and essentially is intending to show that sport, play and leisure require greater understanding of history than simply observing the architecture and listing club records (although the architectural chapters on Pavilions and Grandstands are genuine delights). It requires a knowledge of how space was utilised and developed, and what accidents of personality, business, culture and geography in the wider world outside sport allowed some sports and grounds to thrive while others died. It also shows how some spaces are defined by sport, but also how sports, clubs and associations are defined by the space they occupy. The river is an obvious candidate for this treatment (and I never knew there were so many boathouses), but he also looks at length at such intriguing places as Wembley Park, Crystal Palace Park, Lea Valley, Dulwich and the Westway – all of which have long, complex relationships with myriad sports – to uncover stories that may otherwise only be known to local historians, or single-sport specialists. This approach repeats itself throughout the book, allowing ‘found spaces’ such as the South Bank skatepark to be included alongside manicured golf greens and expensive new all-seater stadia. 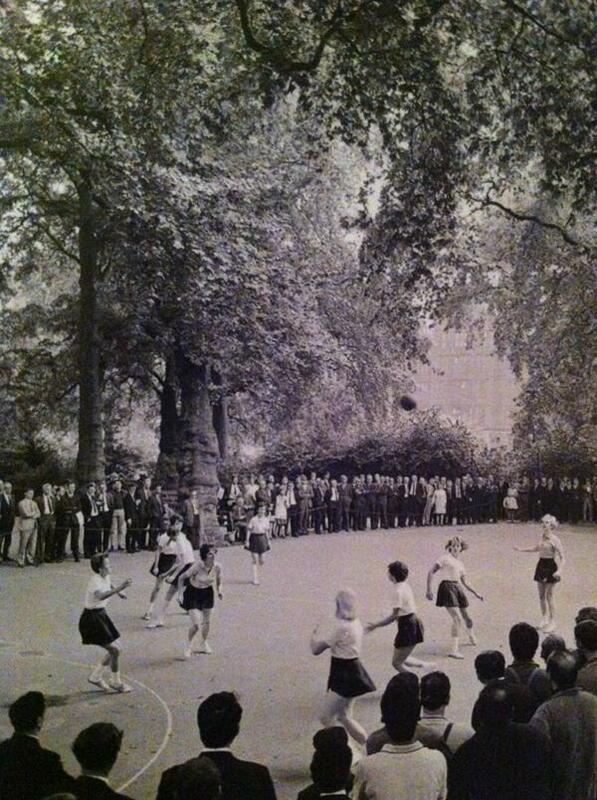 Office workers play netball in Lincoln’s Inn Field, 1950s. Oh, and if this isn’t enough the whole thing is illustrated lavishly throughout – indeed, they may have tried to cram in one or two photographs too many – with some spectacular mapping also included. It makes a fine accompaniment to another book I read recently, on a more modest scale but still of some importance to London’s sporting heritage. Fighting Men Of London by Alex Daley is essentially an oral history – although the author occasionally makes his presence felt – of London’s boxing history between the 1930s and 1960s, told through seven former fighters. It puts some flesh on the bones of Inglis’s research: the boxers describe the lost boxing rings of London such as the shambolic Mile End Arena or the refined Stadium Club in Holborn, where inter-war gentlemen would dine ringside, ignoring the blood that splashed into their supper. 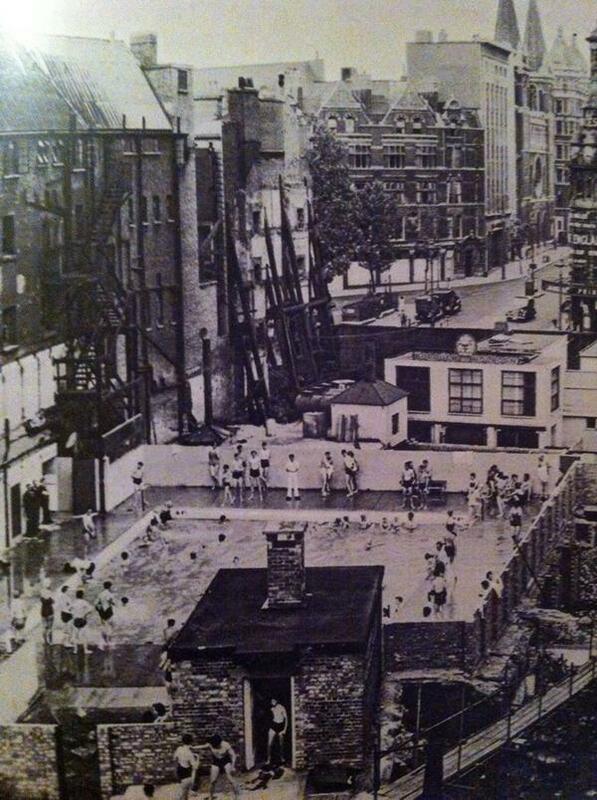 They also talk about the old Central London gyms like Bill Klein’s in a basement in Fitzroy Street or Jack Solomon’s near the Windmill Theatre with an eye for detail that makes you think of Gerald Kersh. The appetite for boxing in this age was vast, and many of the fighters interviewed built up large followings as they fought as frequently as once a month. None of them really made it into the big money though, and it’s notable that upon retiring several became involved in crime – The Krays, former boxers themselves, have walk-on roles in several of the stories. As a history of East End culture, it’s illuminating.